On November 9th 2018, my brother and I set out to ruck 50 miles in Jacksonville Beach, FL. Here, I wanted share how I trained and some lessons I learned along the way. Rucking is essentially urban hiking. It involves carrying a weighted backpack and walking at a fast pace or lightly jogging. For our race, we were required to carry a 20 lb weight and all of the supplies we would need for the duration of the race (e.g., water, snacks, other provisions). In the end, our packs were ~30 lbs. 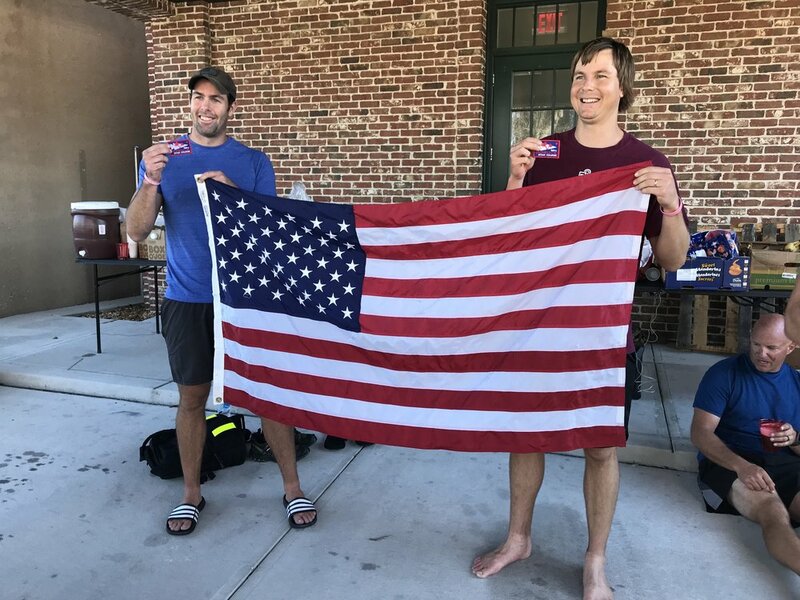 The GORUCK Star Course race is very unique. It is completed in teams of 2-5 people. You have no clue what the “course” will be until you get to the starting line. Then, you are handed a sheet of paper with a list of waypoints and you plan your own route. If you plan well, the course will typically be around 50 miles. If you don’t plan well, it could be a lot farther. For our course in Jax Beach, I think the minimum distance was about 48 miles. My brother and I ended up doing exactly 50. Before committing to this race, the farthest I had ever walked was a 6-mile hike I did about 4 years ago. My weekly workouts involved some strength training, yoga, and maybe the occasional 1-2 mile run. That all changed when I decided I would do the Star Course. I started by rucking three days a week: Monday, Wednesday, and Saturday. I would do shorter rucks (1-3 miles) during the week, and a longer one on Saturday. I gradually built up the miles as my legs got stronger and my endurance improved. I also found ways to incorporate rucking into my normal routine. For example, I wore my ruck pack every time we walked the dogs, which was about 1.25 miles a day. As the race got closer, I started rucking 4-6 times a week. I would do much longer rucks on the weekend when I had more time. For example, I might do 12 miles on Saturday and then 8 more on Sunday. Because I was going at a fairly slow pace compared to running (~14 min miles), it took a lot of time to put in the miles needed for the race. The longest ruck I completed as part of training was 30 miles. It destroyed me. The last 4 miles were probably the hardest thing I had ever done, and the Florida summer heat definitely didn’t help. However, going 30 miles was critical to my training. It gave me the mental confidence I needed to know I could complete the race. To put in the necessary miles, I needed to recover quickly and keep my legs in working condition. After every long ruck, I would do at least 10 minutes of yoga to stretch out my legs and shoulders. I would do a lot of half-sun salutations, wide-legged forward folds, Garland pose, and side-of-hip stretches. I also did separate leg stretches and seated forward folds. The exact exercises depended on how my body felt after that day’s ruck. After yoga, I would do about 5 minutes of light breathing while seated. Slow breathing after exhaustive exercise has been shown to significantly reduce oxidative stress and I found it to be a critical part of my recovery. As for breath holds, I actually stopped my typical practice to make the training more difficult. Then, about 1.5 months before the race, I started it back up again. My first long ruck after bringing back my breath hold practice felt so much easier. I had forgotten how much energy a daily breath hold practice gave me and I was very happy to add this back in. Overall, I feel that yoga and breathing exercises made my training much more palatable and effective, and I didn’t have to dedicate a ton of time to it. Sure, I was always a little sore, but these practices helped me recover and allowed me to do normal things I enjoyed (for example, going surfing after a 20-mile training ruck). My brother and I completed the race in 16 hr 55 min, putting us in 11th place out of 66 teams. I messed up one of the waypoints in my phone (see lessons learned below), so we ended up walking 2 extra miles. Although it seems trivial given the distance, we were about 40 miles in, so those extra 2 miles were heartbreaking at that point. But, we laughed it off, got some water, and just kept walking. The race was one of the hardest things I’ve ever done, both physically and mentally, but it was an amazing experience. I am very grateful I completed it. I will be back next year to give it another shot. Endurolytes (electrolytes). These were a lifesaver. Here are some things I learned that I will do differently next year. Plan your route effectively. Once deciding the order of the waypoints, write them down in the order you will be going to them so you can refer back later. For route optimization, we used an app called inRoute, which was AMAZING. However, I wish that at every waypoint I would have used a different app (e.g., Google Maps) to confirm the route to the next waypoint. For example, once at point B, inRoute gave us a route to point C. But, I wish I would have also used Google Maps to calculate the route from B to C as confirmation. We had one waypoint where inRoute thought two roads connected, but they didn’t, so we had to add 2 miles to our route. If we had checked with Google Maps, we would have seen that we needed to go a different way and avoided that detour. Train like it is race day. Instead of stopping my breath hold practice at the beginning of training, I wish I had continued from the start. I also wish I would have packed my ruck pack as if it were race day every time I went out training. Instead of trying to come up with some elaborate plan, I wish I would have just trained every day as if I was going out to do 50 miles. Then, when the race started, it would have felt like just another day of rucking. Train tired/sore. The hardest part of the race was the last 10 miles. The first 40, although obviously hard, seemed to go by pretty quickly. But those last 10 were horrible. Therefore, next time I will purposely train when I’m exhausted or tired to prepare my body and mind for that challenge. If you’re interested in rucking or have any questions about my experience, leave a comment or email me at nick@black-sand-yoga.com.